I'm new to Flowers by the Sea and really like your catalog. But while looking at another online nursery's catalog, I saw that they offer free shipping. But they also charge more than you do for the Salvias I want to buy. Why don't you offer free shipping? You know what they say about there being no such thing as a free lunch. It's also true that free shipping doesn't exist. 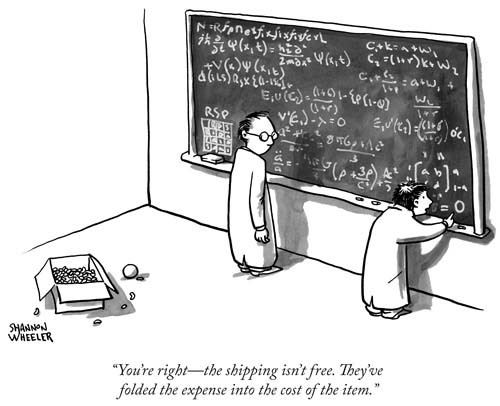 We like the New Yorker cartoon published here, because -- pardon the wordplay -- it sums up the myth of free shipping. Mail order retailers all must find a way to cover the cost of shipping. To paraphrase Shannon Wheeler's cartoon caption, some online nurseries fold the expense of shipping into the cost of they charge for their plants. We don't do that. Another survival technique is to decrease shipping costs by severely trimming plants to make more fit in small boxes. We don't do that because it harms the quality of plants. Instead, we created a customized delivery rate schedule with our shipper, UPS. To minimize plant prices for everyone, FBTS shipping fees increase as order size grows and delivery distance from our farm increases. Yet the larger your order is, the smaller our shipping fee is per plant. FBTS doesn't make money on shipping and tries not to lose it either. "Free shipping" would force us to significantly increase plant prices, because we would never decrease the quality of our plants or delivery system. We like to think that our solution is a formula for fair pricing.